blogging | Kris Johnson's Blog…sort of. One of the most memorable quotes from Tim Burton’s Batman is Jack Nicholson as the Joker declaring “This town needs an enema!” Though the Clown Prince of Crime certainly had sinister designs on Gotham, he had a point: the city was a mess and needed a thorough cleansing. His choice of words may not have appealed to those of a delicate and genteel nature (who would likely have preferred “facelift” or “makeover” to the vulgar colonic), but the idea has always resonated with me and it springs to mind anytime I see something that is clearly in need of change. I’ve often felt that the phrase applies to this very website, both in terms of content and design. As an example of something potentially uninteresting, I offer up this very post. I like to keep the meta-blogging (or “blogging about blogging”) to a minimum here and leave it to folks like Lorelle VanFossen, who meta-blog far better than I ever could (or would want to). My meta-blog posts tend to center around whatever issues I’m currently experiencing with WordPress and such; I don’t do advice. When I do dip my toe into meta-blogging, I do so with the understanding that—unless you’re a WordPress user (or a huge dork)—the excursion isn’t going to be terribly interesting, but I also do it knowing that the process of writing helps keep the gears turning in my head and there are a few people reading who do blog with (or without) WordPress and muck around with CSS and web design, and they’re likely to provide some very insightful feedback. Content is far more important than design and aesthetics, but over the past few days I’ve been very focused on the look and feel of this site. I upgraded to WordPress 2.3, which had some unintended consequences, specifically in the areas of commenting and post tags, but I think I’ve taken care of those. Digging through the site, however, made me realize that I’d like to spruce things up a bit (the Library page is in dire need of an overhaul, for instance, and the Now Reading section in the right-hand sidebar could be cleand up), take care of some browser-dependent design quirks, organize things a bit better and maybe cut some of the extraneous bits. 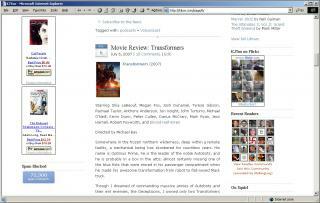 I spent an absolutely stupid amount of time last night going through old blog entries (I’m about a third of the way done) and making sure that the markup for images and footnotes was consistent (and adding images to some movie review posts that didn’t have them); the idea is to create a consistent look across the entire site, but also to make switching to a new theme easier, should I ever decide to stop using Brian Gardner‘s Blue Zinfandel. Unfortunately, despite a lot of CSS tweaking and web searches, I was unable resolve a browser-specific rendering problem: Internet Explorer versions 6 and 7 both have issues with floating images. 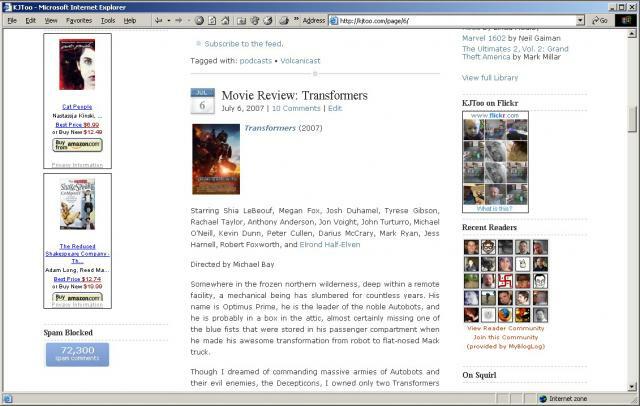 The IE screen shot below illustrates the problem: the text immediately beneath the Transformers movie poster image (which is “floating” on the left of the center column) should be to the right of the image and wrap around as it flows beyond it. Firefox renders it properly but neither version of Internet Explorer does. The problem is very likely something to do with floating images within floating sections or visible overflow or something, but I haven’t been able to nail it down yet and it’s pretty annoying; especially since I’m almost positive that it was working properly in the past. Finally, there’s the new “Currently Playing” and “Recently Watched” sections on the left-hand sidebar. The former was blatantly stolen from Greg Howley (though Rob Miller deserves some credit, too, as his Now Reading plug-in set me on the “media I’m consuming” path in the first place) and the latter was an obvious extension of the idea. Neither of them are plug-ins (though that could change), and they originally featured just cover images and titles. However, converting them to Amazon links has removed some of the hassle of maintaining them: I don’t have to hand-write the HTML or host the images myself. I’ve been embedding my Amazon Associates ID in DVD, book and video game links for over a year now, but this is the first time I’ve used the Buy Now button, something I’ve been avoiding because I don’t want the site to feel like an ad (don’t worry, I don’t plan to start using Google AdSense anytime in the foreseeable future). 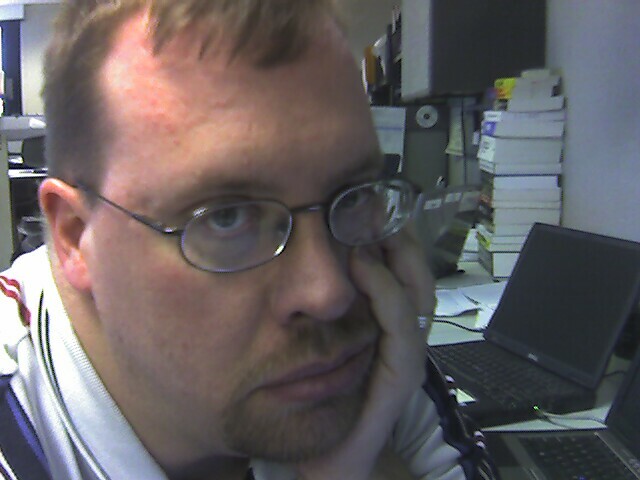 So there you have it: I’m feeling a little restless about the current state of KJToo.com and I want to shake things up a bit. I welcome your suggestions and feedback and appreciate your patience if I somehow manage to break the site while I’m fiddling. There are times when I start a blog entry and then something shiny comes along to distract me and the thing never gets finished. I had, until recently, nearly two dozen such posts in WordPress, just waiting for me to come along and finish them; everything from movie reviews (The Station Agent, Alien Nation, Pirates of the Caribbean: Dead Man’s Chest, 300, The Prestige, Pan’s Labyrinth) to book reviews (Do Androids Dream of Electric Sheep?, Maximum Ride: The Angel Experiment) and even theater reviews (Spamalot) and short fiction (The Tale of the Ugly Pony, Major Dorque: The Soldier’s Story). I waded through the incomplete posts this morning and deleted most of them, except the short stories and one Game Night recap (yeah, Gus, it’s the one you’re waiting for). Here’s a sample of what got axed: my started-but-never-finished Origins 2007 recap from way back in July. A lot of fun stuff happened at Origins, but I got hung up on the style I’d chosen for the intro and never got around to actually writing about any of it. As the first rays of sunshine begin to bathe northeast Ohio in their warmth, the MVoD cruises quietly southward along Interstate 271 toward Columbus. Safely ensconced within the sheet metal and fiberglass cockpit, two bearded geeks—unused to being active at such an early hour—rub the remnants of sleep from their bleary eyes and scan the distant horizon for the first glimpse of the Columbus Convention Center, to which thousands of geeks—bearded and unbearded alike—make their annual pilgrimage for Origins, the ne plus ultra of gaming fairs. “Long has it been since we walked among our people,” declares one of the bearded geeks. “Indeed,” the other agrees.It is neither pertinent nor especially interesting to distinguish between bearded geeks, for one is as much like the other as to make ascertaining anything beyond the most trivial and minute of distinctions an exercise in futility. For the sake of simplicity, we shall henceforth call them Kris and Chris, and note that even their names are so similar that the human ear cannot detect any significant discrepancy in pronunciation. The two are, for all intents and purposes in recounting this tale, identical. Unerringly and without hesitation, Kris guides the vehicle toward the Convention Center, while Chris interjects with only the occasional clucking of his tongue against his palate, tsking as one might to a horse who is well familiar with the route but appreciates the subtle encouragement nonetheless. Now the majestic spires of Columbus are visible, glimmering towers of crystal rising up through the faraway mists, and the bearded geeks are momentarily struck dumb by the magnificence before them. Time slows, the nearness of the destination taunting the weary travelers with a siren call that transcends sound, the shimmering jewel of the city urging them ever onward. And when it seems that the road will ever stretch out in front of the carriage, leaving their mecca unattainable for all eternity, time collapses in upon itself like a spyglass and at last they arrive. Sitestuff: I love SPAM, I hate spam. According to the stats at MyBlogLog, KJToo.com has 23 readers, which sounds about right to me; there are also a handful of people who read the posts via the RSS feed, but I really have no idea how many. That’s not exactly a huge audience, but the number of spam comments filtered out by the Akismet plugin ranges anywhere from a dozen to several hundred on any given day; if you’re reading this, the comment spammers really want you to see their junk.Or at the very least increase their Google ranking for erectile dysfunction medication, auto insurance and naughty, naughty boys and girls. Today was a high-volume day for comment spam. The online pharmacies, insurance agents and purveyors of various forms of taboo (if not downright illegal) sexual practices attempted to hit KJToo.com with roughly 500 spam comments in the past twenty-four hours, only one of which made it past Akismet. Since I’ve been using the plugin, less than a half-dozen legitimate comments have been incorrectly trapped and perhaps two dozen spam comments have made it through the filter. Considering that Akismet has trapped more than twenty-one and a half thousand spam comments in the past two years, I’d say it’s a pretty good track record. There’s some concern that WordPress users are putting all of our comment spam fighting eggs in one basket with Akismet; the plugin relies on external servers to function, and a failure of those servers could result in a flood of unfiltered spam comments on thousands of blogs worldwide. Nasty! It’s a risk I’m willing to live with, though, as Akismet allows me to let people comment on KJToo.com without having to register or enter a CAPTCHA code. So, comment to your heart’s desire, all twenty-three of you. Akismet has your back, and mine. Test sites for WordPress themes display several standard elements so theme hunters can see how things like images and bulleted lists look on the page. As it happens, I’m in the process of tweaking the Blue Zinfandel theme and I’ve got a few random things that I wanted to talk about, giving me the perfect opportunity to put the theme through its paces and solicit additional feedback. I picked up a copy of Fool Moon today, the second book in Jim Butcher’s urban fantasy series, The Dresden Files. I tore through the first book, Blood Moon Storm FrontEDIT: Blood Moon? Where the hell did that come from?, over about two days when I was on vacation in Michigan, so I’m going to start Fool Moon as soon as I finish Eragon, which I’m about two-thirds of the way through.Liar, liar, pants on fire. Technically, I started reading Fool Moon while I was waiting for my General Tso’s Chicken at the China Express. My father was featured in a documentary that has (I’m told) aired twice in Finland. Laura and I got a copy of the 50-minute DVD in the mail yesterday. I think I’ll talk about it a little more once I’ve had a chance to watch it again. Laura’s birthday was Sunday. If you’ve been paying attention to My Twitter, you’ll know that my gift to her was food poisoning. I also got her some foul-tasting (but pretty) tea, a birthday card that looked familiar because I gave her the exact same one sometime in the past couple of years, flowers that were supposed to be a surprise but were anything but, and a couple of movies on DVD. 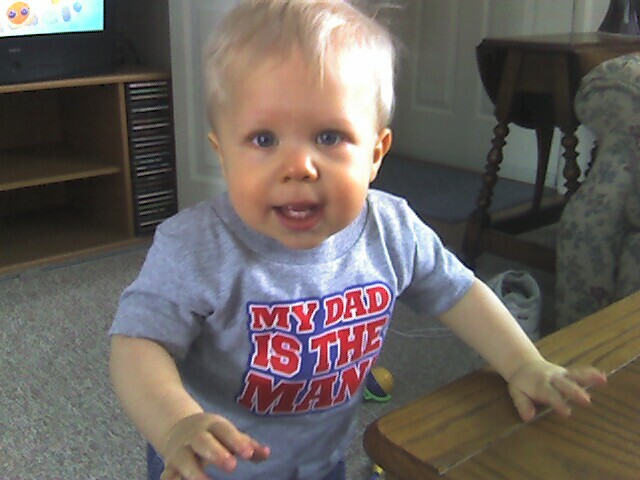 Kyle was sick a couple of weeks ago, but he’s feeling much better now. Actually, the entire Johnson household was under the weather; Kyle was the only one who didn’t seem to realize that he was sick. He had a cough and a runny nose, but was acting for the most part like nothing was out of the ordinary. If Laura and I were too slow with the tissues, Kyle would wind up wiping snot all over his face. Bleah. I didn’t watch the entire premiere of The Riches on FX, but I did see the second episode last night. Eddie Izzard and Minnie Driver are both very good, and the show has a dark side that didn’t come across in the ads that drew me to it in the first place. I like what I’ve seen so far, though. On the topic of new shows, I also enjoyed the premiere of Raines starring Jeff Goldblum. The show has a very cool concept (cop talks to the victim of the homicide he’s trying to solve) and I really like the way Goldblum plays the character; Michael Raines has all of the quirks I associate with Jeff Goldblum, but he’s definitely more ruthless and edgy than I expected him to be. I appreciate that. Rae promises that Robin Hood will get better with the next episode. The first three episodes weren’t bad, but they could certainly have been better. I don’t think I like the default styling for ordered lists. Expect tweaks. It’s Game Night. I’m hoping to play Arkham Horror, but I’ll be happy playing pretty much anything. While writer Mike Mignola and director Guillermo del Toro work on Hellboy 2: The Golden Army for a 2007 release, Tad Stones and company are working on two animated Hellboy movies that will be aired on Cartoon Network’s Toonami sometime this year. The animated movies feature Ron Perlman as the voice of Hellboy and John Hurt as Doctor Broom. Tad Stones keeps a production diary at Hellboy Animated, which I found only yesterday. No sooner had I subscribed to the RSS feed than Tad made the Toonami announcement. I’m also psyched (do people say that anymore?) that Toonami will have a Fantastic Four animated series, the second Ultimate Avengers movie, and an animated Iron Man feature. I have a secret shame and his name is Doctor Angus (AKA Harry Enfield). I enjoy every one of the Burger King commercials featuring the faux motivational speaker, especially the most recent one in which Doc Angus declares, “It’s that easy; it’s that cheesy!” What the hell is wrong with me? Despite the fact that I will rewind the TiVo to watch Doctor Angus commercials, I’ve never tried the Angus burgers at BK. Oh, I’ve been tempted to, but I almost never think about Doctor Angus while I’m actually at the drive-thru. Weird. I also enjoy the new VW ads featuring my favorite pancake lover, Peter Stormare. Stormare, dressed in white and speaking with a thick German accent, “unpimps” a series of rides by flinging them with a trebuchet (“Oh, snap!”), flattening them with a shipping container, or otherwise demolishing them. Yes, I rewind these ones, too. No, I don’t plan to purchase a Volkswagen anytime soon. Snap, indeed. Oh, and did I mention that the upgrade to WordPress 2.0.2 is complete and comment screening is deactivated? The upgrade to WordPress 2.0.2 is complete and comment screening is deactivated. I’ve turned on comment screening until I can upgrade to WordPress 2.0.2. Once the upgrade is complete, I’ll disable screening again. Comments made while screening is active will be placed in a queue until I can approve them, so don’t panic if your comment doesn’t appear immediately. If you’re not reading this from the RSS feed, you’ve likely noticed that I installed Scott Wallick‘s “plaintxtBlog” theme for WordPress last night (if you don’t see any changes, press Ctrl-F5 to refresh the page). I wasn’t happy with certain aspects of the old theme (which I designed) and I thought it was time for a change. I’m looking for a nice way to bring back the Recent Comments and Tag Cloud features that were active in the old theme, but it’s going to require some creativity (or a plugin) to get them integrated in a manner that pleases my eye. In the meantime, let me know what you think about the new theme. How are the colors? Fonts? Font sizes? What’s your general opinion of the layout? Internet Explorer can [censored] my [censored]. I spent two hours last night poring over the WordPress template files and the stylesheet for the theme I’m building, searching for some error that would explain why IE was rendering the page improperly. See that grey border on the right? It’s supposed to be a solid line from top to bottom, but IE was pushing it to the right partway down, and rendering it twice at the bottom of the page. After much frustration, I realized that there must be something “special” about the content of one or more entries on the page. Through trial and error, I managed to isolate the problem to a single entry: a movie review for Dungeons & Dragons: Wrath of the Dragon God. I tried removing any unusual formatting (image float, footnotes) without success. Finally, after hacking the entry to pieces, I removed a couple of lines where italic text wrapped from one line to the next. Voila, no more rendering problem. It didn’t make any sense, but there it was: italics. So I searched for “internet explorer italics bug” in Google and I came up with this entry at PositionIsEverything.net. Seems IE doesn’t respect element sizing very consistently. The author provides several good examples as well as a couple of ways to work around the problem. I tried the “overflow: visible” method, which seemed to work until I put the rest of the contect back in the entry, at which point the entire middle section of the page got bumped down below the sidebars in IE (but not in Firefox). This morning, I set the width of the rogue element to 95% and voila… all better. Well, except for a little “extra” padding on the right, but that doesn’t actually affect the rendering of the border. I’m not finished working on the new theme, but this particular bug as been fixed. IE can still [censored] my [censored].